NEWPORT, Ky. -- Brighton Center’s hope for students in its Youth Leadership Development program can be summed up in three words. “We encourage our youth to dream, believe and achieve,” said Michelle Bullis, the after-school program’s coordinator. The longstanding program is at the “heart of Brighton Center’s mission,” she said. And it has been helping to empower Northern Kentucky’s middle school students for nearly half of the local nonprofit’s 60-year history. So how does a decades-old outreach program stay relevant in the ever-changing, sixth- through eighth-grade social scene? The answer is simple: The middle school students, themselves, help lead the club activities at their respective schools. Brighton knows every school and community it serves is not “one-size-fits-all.” The varied program is offered at Newport, Tichenor, Holmes and Campbell County middle schools, as well as Campbell County’s alternative school. Using a curriculum designed to develop and increase social and emotional well-being for teens, students involved in the clubs are provided with support strategies to help them avoid problem behaviors and opportunities to prepare for successful adulthood. “We utilize experiential learning through small-group discussion, role-playing and service learning,” Bullis said. Participants also explore options for life after middle and high school through job-shadowing experiences and college tours. Additionally, they’re exposed to the arts with several field trips to local arts, cultural and recreational events, she said. These experiences help build self-esteem, responsibility and empathy, as well as feelings of accomplishment and a sense of belonging to their community, Bullis added. Newport Middle School's club recently collected materials and created nesting bags to help local birds make nests for their young. To promote literacy, the students are constructing book houses that will be placed all over the city. The idea is to get more residents reading with an easy “take-one, leave-one” approach to books, said eighth-grader Ciara Walters. 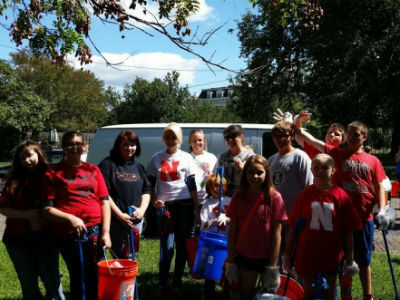 Students participating in Brighton Center's Youth Leadership Development program at Newport Middle School organized a service-learning project earlier this school year to clean up trash in their city. Despite their diverse backgrounds, that drive to make the world a better place is something each participant shares, Bullis said. It’s also the reason why most join the after-school club. Any interested student is invited to join, but Brighton encourages participating schools to extend special invitations to youth who are considered “at-risk” for negative, high-risk behavior because they’re not already involved in a positive, after-school activity. Ciara, and a group of her friends, say they joined the club at Newport Middle School this year because they knew it would be fun, and it would get them out of their school and into the community. “It makes us useful,” eighth-grader Morgan Smith said. So far this year, the group has not only initiated the birding and literacy projects, but also collected school supplies for needy classmates, picked up trash around their city, and created an Earth Day lesson they’ll present to younger students in Newport Independent Schools. Helping others is at the core of the club in Newport – and the leadership skills they’re picking up along the way is just icing on the cake, according to eighth-grader Darren Bravard. “It gets your blood pumping,” he said of the exciting opportunities he has experienced since joining Newport’s club as a sixth-grader. For school administrators, seeing students passionate about becoming leaders in their community is exciting to watch, said Diane Hatfield, Newport’s district curriculum specialist. The program allows students to take ownership of their community, according to Karen Hughes, Tichenor Middle School’s Youth Service Center director. But another benefit of the program is exposing them to all Greater Cincinnati has to offer, she explained. “It gives our students some opportunities that they might not otherwise get to experience: meeting politicians, visiting colleges, going to sporting events… and trips to the Aronoff Center and local art museums,” she said. According to Brighton, creating a fun, safe and supportive environment for students after school results in a decrease in juvenile delinquency. Data collected from each of the local sites last year show additional benefits. For example, every student involved in the Youth Leadership Development program was promoted to the next grade level. The hope is as more and more students go through the program, communities will have more successful leaders who will continue to make positive choices in their high school, college and adult years, Bullis said.